This is a wonderful spring dessert that comes from my mother’s collection of recipes and is dedicated to her memory. 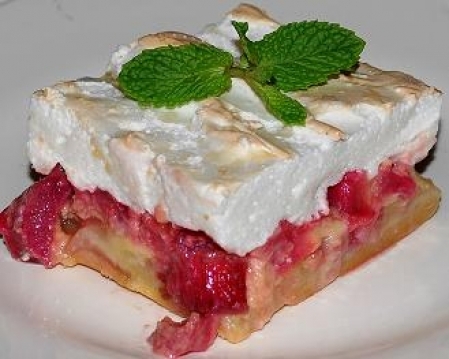 The tartness of rhubarb and sweetness of the crust and meringue complement each other nicely. Beat together all ingredients for the crust in a medium to large bowl. Or use your hands, sometimes they can be your best tool when mixing butter and flour. Press dough into the bottom of a 9″ by 13″ pan and bake in a preheated oven at 350 degrees for 20 minutes or until lightly golden brown. Make filling by mixing egg yolks and evaporated, then add dry ingredients and mix well and stir in rhubarb. Pour into crust and bake in a preheated oven at 350 degrees for one hour. Ten minutes before removing dessert from oven make meringue. Make meringue by beating the egg whites in a medium bowl until frothy, add remaining ingredients and beat until stiff. Remove from oven and evenly spread meringue over dessert and bake in a preheated oven at 400 degrees for 5 minutes or until light golden. Let cool before serving. I am making this fabulous desert for my son, Jonathan’s birthday. He requested it instead of the angel food cake, which was his 2nd choice if I couldn’t fine rhubarb. I live in Houston TX and it is hard to find sometimes.